Tasers: Method of Non-Lethal Force or Instrument for Abuse? | Hupy and Abraham, S.C.
Tasers: Method of Non-Lethal Force or Instrument for Abuse? When police fatally shoot a suspect during a hostile situation, many ask why they didn’t use a “non-lethal” method such as a Taser instead. While it’s true that Tasers can diffuse potentially deadly altercations, they can also be used inappropriately and hurt innocent people. If Tasers were used only to subdue violent criminals as an alternative to gunfire, who could disagree? But it appears they’re being used in situations that could be resolved without using force at all. 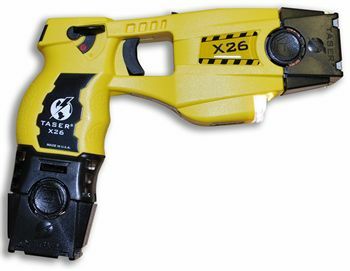 To see how Tasers can be misused, look no further than Miami, FL. In less than eight years, police in Miami have used their Tasers more than 3,000 times, an average of more than once per day. While some of those tasered in Miami were violent criminals, most weren’t. The majority were unarmed and suspected of minor violations. Among those tasered were a 6-year-old boy and a 12-year-old girl. Worse yet, 11 of the 3,000 tasered by police in Miami died. This calls into doubt whether Tasers should be universally considered “non-lethal.” Even when Tasers don’t kill people, they can still leave permanent burns and scars. And if the Taser itself doesn’t inflict harm, victims can be seriously injured when falling to the ground. Last August, 19-year-old graffiti artist Israel “Reefa” Hernandez was caught “tagging” an abandoned storefront by police. Hernandez tried to run away, but was tasered as he turned a corner. Within an hour, he died of heart failure. Many are questioning how Tasers can be considered non-lethal or even safe if they can kill an otherwise healthy 19-year-old boy so easily. Another concern about Miami’s use of Tasers is the lack of accountability. Although officers are required to document every discharge, that hasn’t been the case. Tasers record every discharge on built-in microchips, and Taser logs often don’t match police records. By law, police are required to document each use. When University of Miami law student Richard Rosengarten saw an officer Taser a homeless man in a grocery store, he filed a complaint. An investigator found no record of the altercation described by Rosengarten, but did find a Taser log corresponding to the exact time Rosengarten described. The log suggests the officer tasered the homeless man four times. The statistics of how often police use Tasers are unsettling enough. But it’s also startling to think about how many undocumented Taser incidents occur on top of the ones we know about. If Tasers are going to serve their intended purpose or peacefully resolving conflict, police need to use them more judiciously. Police must also understand that Tasers are more dangerous than once thought and shouldn’t be used on anyone who doesn’t pose an imminent threat.